Thousands of modern high-density homes are being delivered in Cambridge. Kent Design organised a study tour in the city on 4 May 2014 to find out if this emerging success story can be replicated in Kent. Glen Richardson, Urban Design and Conservation Manager at Cambridge City Council. Planning officers can sometimes have a thankless task convincing their members of the long-term benefits of good design in housing developments. Familiar refrains from sceptical members include: “People want traditional housing types with conventional back gardens and they don’t like modern design.” Kent Design organised the study trip to Cambridge to challenge some of these preconceptions. Cambridge is putting its ambitious growth plans for more than 14,000 homes in and around the city into action after a decade of painstaking planning. It has not been an easy ride, says Glen Richardson, Urban Design Manager of Cambridge City Council, but he was able to show a group of planners, members and design professionals from Kent several built schemes in South Cambridge where a new paradigm has worked brilliantly. 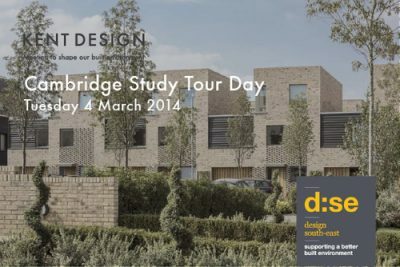 The tour took in the emerging urban development around the Trumpington area on the city’s southern fringe, including Countryside’s newly built 306-dwelling scheme at Great Kneightonand Barratt’s 353-dwelling scheme at Trumpington Meadows – both of which are proving to be a big commercial success. The tour moved a bit further into Cambridge to view the Accordia project to see how the award-winning scheme has matured into a much-loved place. Land values and house prices make a telling case for investing in such details. Four-bed homes at Great Kneightonare fetching as much as £550,000. Barratt’s properties at Trumpington Meadows are less expensive, but the council has worked hard with the housebuilder and architect Allies and Morrison to deliver a high-quality design. As the result, the dwellings have been designed in the vernacular using gault brick fashioned from local clay, roof slates and (decorative) tall chimneys that are germane to the area. The scheme is one of the first in Cambridge to use design coding, strictly prescribing design details such as heights of walls and window types. The final stop was the award-winning Accordia scheme designed by Feilden Clegg Bradley with Alison Brooks and Maccreanor Lavington – the first housing project to win the Stirling Prize, disproving the theory that single-story modern pre-fabs would be unpopular in Cambridge. “The use of balconies and roof gardens at Accordia shows how it is possible to get away from the idea of private gardens 10m deep,” says Teresa Ryszkowska, Planning Services Manager at Dartford Borough Council. A theme running through the day was that early, informal discussions at the pre-application process are crucial, even though it can be difficult to persuade members to pay for the extra time involved. Design quality needs to be enshrined at this stage. Details, such as the quality of the brick should be discussed. Developers do not want to be locked into these details at such an early stage and need a lot of persuasion. However, it enhances the ability to get a better outcome and saves the developer frustration farther on in the process. Given the high-quality designs on show, it was all the more remarkable that projects, such as Great Kneightonand Trumpington Meadows, were delivered during a recession with 40 per cent affordable housing. For example, Countryside fought hard against the 40 per cent figure at Great Kneighton; there was a public inquiry in 2009 and Cambridge City Council won. It helped that Cambridge had a long-standing partnership with a housing association and the affordable homes were so integrated that it was difficult to distinguish them from the commercial ones. Another big challenge was building houses in the face of initial local opposition. Lessons on how to beat the Nimbys can be learnt. “Trumpington residents were not overjoyed at the area being turned from a village into a small town, but they could see that it was a sensible place to develop,” says Peter Studdert. “We had very good ward councillors and residents associations and they helped to sell the benefits such as the guided bus link, new secondary school and job creation”. One of the biggest issues that came up when discussing whether the Cambridge experience could be replicated was quality of staff, especially during a period of swingeing public sector cutbacks. Teresa Ryszkowska said that Dartford was exploring joint working with other local authorities to share quality staff so that decent salaries could be paid. Clive Gilbert of Gravesham Borough Council said its training of members to facilitate their constructive involvement right way through the process was “paying significant dividends”. Research the local materials of the area and incorporate them into the building design. Be open minded and flexible about use of different building typologies. Produce an agreed ‘Development Framework’ and set of design codes at the pre-application stage to achieve a locally distinctive ‘place’. This is especially important where multiple developers involved. Stick to your guns on affordable housing and set up long-term partnerships with housing associations to make affordable housing easier to deliver. Do your utmost to build a quality planning team to create the urban design vision. Continuity of planning staff is crucial to good placemaking. If necessary, share planning staff between authorities to afford the salary for the right person. Clarify design details with architects and developers at the pre-application stage and give them a clear direction of travel at design review. Train members in masterplanning and placemaking and get them involved early in the process. Supportive and informative ward councillors are an invaluable tool to beat the nimbys. Establish a Neighbourhoods Team within the local authority with a specific brief to focus on the large new areas of strategic housing (say 500-5000 new homes) which involves so many specific skills, challenges and co-ordination. These teams could be shared across different local authorities.